Welcome to Red Maple Home Stay ! Red Maple Bed and Breakfast provides you with a discerning Indian Experience. Be it visitors from overseas or travelers from the corporate world. Quality accommodation ideal for leisure and business travelers with International service standards, excellent facilities and value for money, especially for long staying guests is what Red Maple Home stay is all about. At Red Maple you experience a novel touch of Home Stay. Bed & Breakfast New Delhi concept got evolved in New Delhi to meet the accommodation requirements for commonwealth games in New Delhi. It gained prominence and several Home Stay licenses were issued by the Delhi Government. B&B remains a popular choice for various international travelers to Delhi, who are here not only to experience the country, but to connect with locals and experience the real India. At our B&B or home stay or Bed & Breakfast in Delhi our motto is to welcome esteemed guests for a comfortable stay, offering them privacy, safety and the comfort that they desire. Our B&B Delhi is safe for single women travelers. We have had several single women stay with us especially those on work and those visiting from overseas NGO's. We have also had regular single travelers, couples, tourist groups, leisure travelers and amongst others enjoy their stay at Bed & Breakfast Delhi, where it has been an experience to treasure for them. Today there are several choices of Budget Guest Houses to choose from. But why should one choose Red Maple Bed and Breakfast over others !. At Red Maple we offer accommodation with a difference, all rooms are super clean, offer en-suite facilities, bottled mineral water and are tastefully decorated. There is power back up and air-conditioning and heating comforts are provided. A tea / coffee maker is available in every room, a minibar is also provided in every room and so is a safety locker. You have the option to choose from two separate beds in your room or one single large bed. A large buffet breakfast awaits you or you may simply order breakfast of your choice. Free Wi-Fi is included as a value add on. We also have someone to check you in and out round the clock. We invite guests such as yourself for a discerning experience at Red Maple Bed & Breakfast. 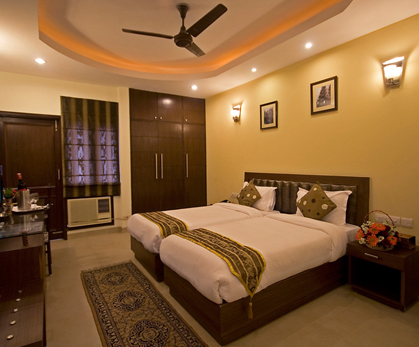 As now you need to look no further in searching for a Bed and Breakfast in Delhi. We assure you of a perfect Homestay in India. At our property you experience true Indian warmth and Hospitality. Our mission is to offer you the best in an affordable accommodation in Bed&Breakfast in India yet you are assured of all comforts offered by any budget hotel in 3 star category. Incredible India is usually discovered thru its gateway of New Delhi and Mumbai. And it is a great start to begin your journey, by choosing to stay at Bed and Breakfast in Delhi, India. 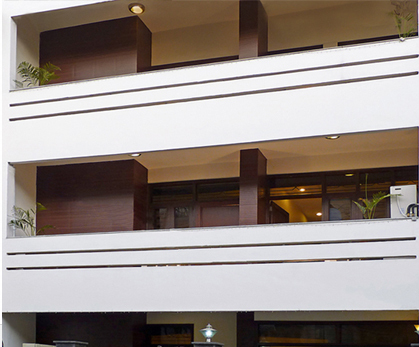 At our property we make you feel welcome for a Homely B&B New Delhi experience. We promise that you would go back happy and tell others about the joys of your stay in popular Homestay in Delhi. Whether it is for short stay in Delhi or for long stays, Red Maple at New Delhi is an Ideal choice. Bringing real Homestay experiences to Life. Think of your favourite recipe, or something you love to eat again and again. Red Maple is good like name staff know the rules of Hospitality everything we like. Keep it up. It was a pleasant, comfortable and really enjoyable joy. We strongly recommend it to the letter than a budget accommodation; it is healthy and wealthy stay with the food too quite good. Many thanks to all at Red Maple! A very happy stay felt welcomed by all staff and thoroughly looked after. Thank you very much ! Thank you, good people of Red Maple we enjoyed hospitality a service me and thank you and my daughter fill next time. Excellent staff very helpful on the dish + the attendant. Enjoyed my stay only some more signboards would help on the road. God bless the staff here.